Coconut, no doubt is a perfect fruit to eat but it also looks great for decorations. If you are in need of some real looking coconuts that you can add in your artificial fruit basket to put on your dining table, Amazing Produce offers a wide collection of fake coconut in different sizes. We make our coconuts looking great and authentic. 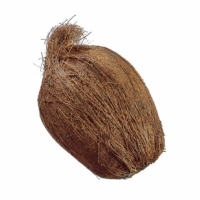 Our artificial coconut is applicable to a variety of applications. You can customize the coconut into different sizes and type according to your decoration requirement. Please feel free to contact with us if you want to know anything else about your coconuts before you buy, or you can purchase from our website. Therefore, we ensure high quality artificial coconut made with real coconut fiber material.